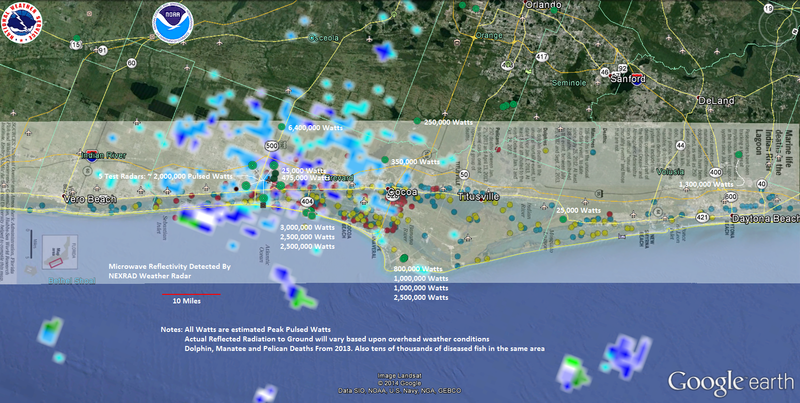 This research looked at spatial evidence of increased disease/death in fish near high powered, pulsed microwave doppler radars and microwave earthstations, using data collected over the course of 3 years from the Florida Fish and Wildlife Conservation Commission. Locations of dead and diseased marine fish were Geocoded with latitude and longitude as well as radar station coordinates. 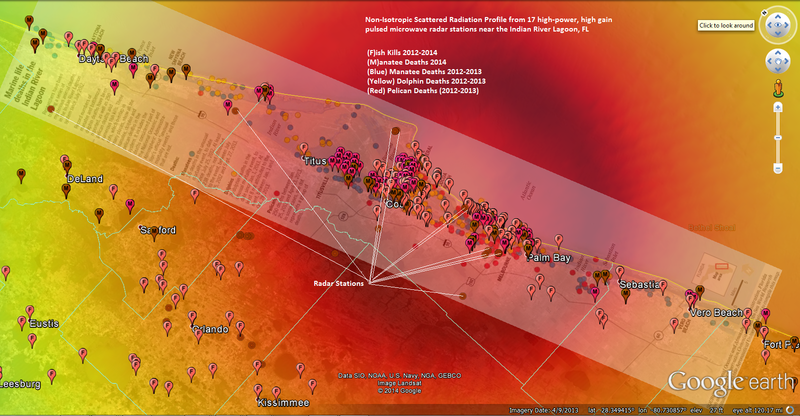 Incidence of disease/death rates at locations vs. distance from radar locations were analyzed using a Python program and compared to an equal number of dummy radar station locations along coastlines and throughout the State. The data was shuffled 10,000 times to establish a p-Value. P-values were consistently below 0.01 for the null hypothesis listed below. Some of the dead manatees are showing signs of shock and some dolphins’ skin is showing signs of possible RF damage and/or burns. That location has approximately 23,000,000 watts of pulsed, high gain microwave radars within a 25 mile area. Since pulsed microwave radars work by refracting and reflecting microwaves off the overhead atmosphere/aircraft and only a small portion of the microwave power makes it back to the radar dish it is theorized that much of the radiation’s power may be “grounding out” into the surrounding earth and highly conductive oceans/salt waterways through electromagnetic inductance and conductance and damaging all wildlife at/near the surface of the waterways via electromagnetic discharge. 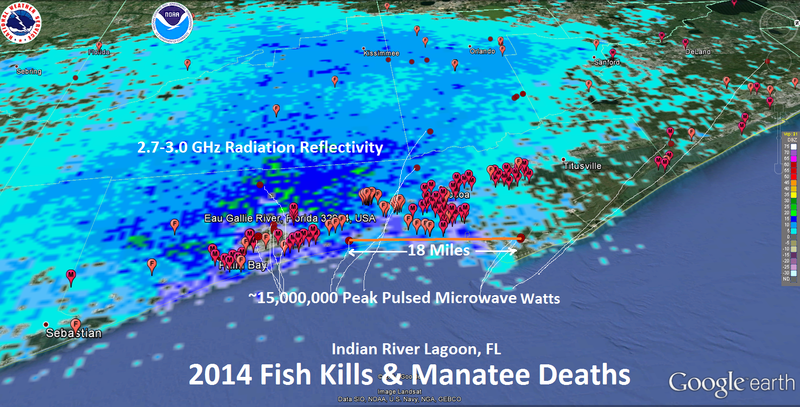 2014 Manatee and Fish Kills Deaths. Manatees continuing to show signs of SHOCK. 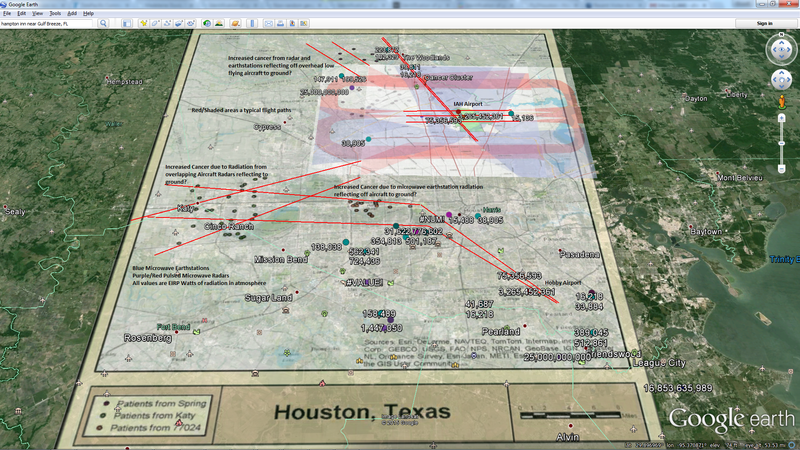 Round red circles are pulsed microwave radar locations. Blue/Light Blue is the 2.7 GHz Microwave reflection back to the local NEXRAD radar in the area. 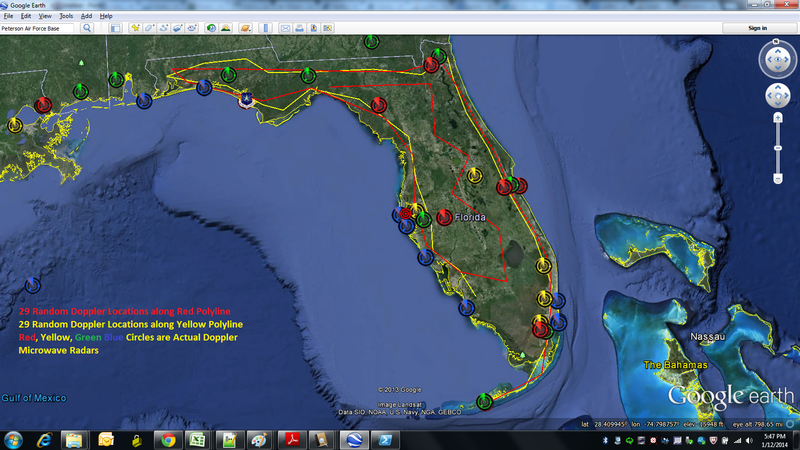 List of Pulsed Microwave Radar Stations in Brevard, FL. EIRP is “Equivalent Isotropic Radiated Power”. It looks like the total radar pulsed power in the area is more like 23,000,000 watts. 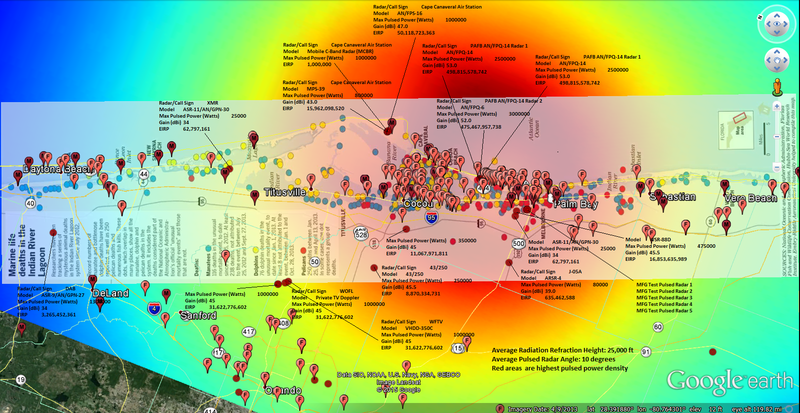 Signs of Electromagnetic Skin Damage on Backs and Dorsal Fins of Dolphins near the Indian River Lagoon, FL (23,000,000 Pulsed Watts of Microwave Radiation). The damage is on the surface he sticks out of the water, acting like an antenna for all of the EMF. 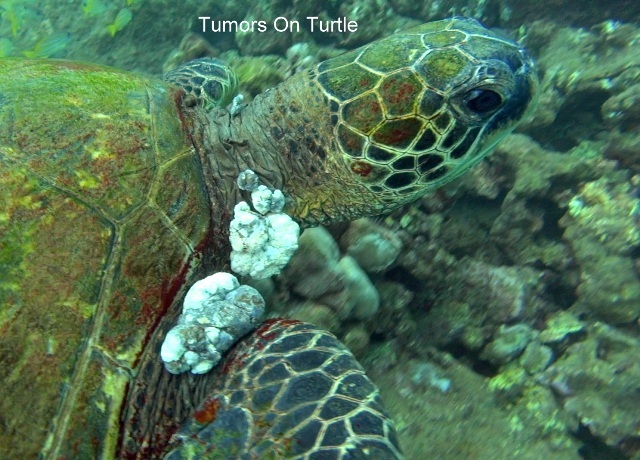 Signs of Electromagnetic Skin Damage (Tumors) on Head and Neck of Turtles near the Indian River Lagoon, FL (23,000,000 Pulsed Watts of Microwave Radiation) and Kauai, HI (30,000,000 Pulsed Watts of Microwave Radiation). The damage is on the surface he sticks out of the water, his head and neck, acting like an antenna for all of the EMF electrical discharge. Highest Doppler 2.7 GHz refracted microwave radiation agrees with highest area of (F)ish Kills due to disease and hypoxia. 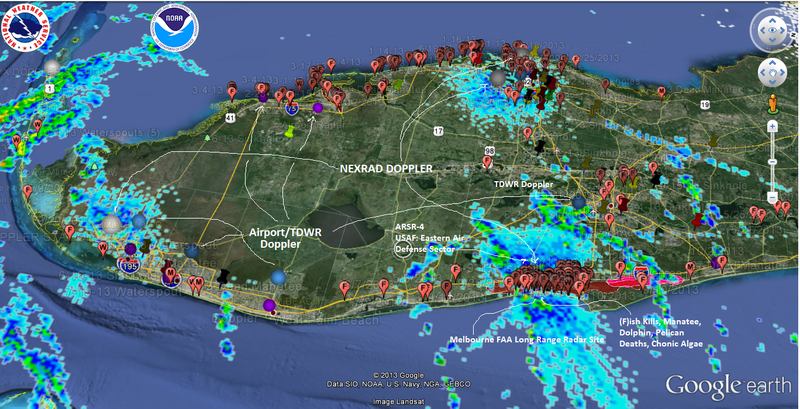 The last time I ran this analysis, I had only identified 14 Radar Locations (FAA and Weather) in Florida. I have added Military Dopplers and I have a total of 29 radars identified. Unfortunately for the manatee, many of the radars were in the same locations as the weather radars and the statistics are more damaging. We may have a significant PROBLEM with our “non-ionizing” high-powered pulsed microwave radars and somebody will have to convince me otherwise. I am going back in time and will report on some older data. While the radars are not ionizing directly, I am the scattered microwave and electromagnetic radiation, which may be increasing increasing oxidation rates and corrosion. The surrounding highly conductive brackish seawater has lots of ions in solution and I believe the pulsed electromagnetic fields are “coupling” with the surface of the water and inducing low-level electrical discharge currents along the surface (skin effects) and charge clusters in seawater. I believe it is our hydrometeors (precipitation) and overhead aircraft causing refraction and reflection of the microwaves and bending and scattering/ducting microwave radiation back to the Earth and oceans. Refraction will be worse during storms, which are really just a temporary increase in refractivity due to precipitation. This chronic increase in weakly oxidizing radiation around the towers is causing accelerated AGING and decay in the surroundings. I think it is also the cause for the chronic wasting & disease of other biology around us INCLUDING US. Somebody should check those starfish for dissolving calcium carbonate endoskeletons, the West coast is lined with high powered military tracking radars on top of the normal weather radars, making it much worse. This will be the same problem for all countries with radars. Our military paranoia and high tech gadgetry is destroying all of nature’s health. Boy, when they latch onto something they think can produce millions in funding they can get pretty far fetched! Like global warming, they create an almost religious dogma that the “science is settled” and THIS is the problem causing THAT result. No other ideas will be tested. No other hypothesis will be published or permitted media attention. Florida is loaded with nuclear power plants spewing radioisotopes into the air, into the cooling water these animals swim in. We must not study anything construed as “anti-nuclear” as that’s going against the “green agenda”, no matter what anybody else thinks….or even proves! THIS causes THAT. R-12 refridgerant that was 89c/pound at Walmart was the reason for the ozone hole over Antarctica..PERIOD! We banned it and invented R-134a at $12/pound, a bonanza for the producing corporations like Dupont. Today, the ozone hole is so big it nearly covers Southern South America! R-12 had nothing to do with it….DING-DING-DING ring those alarm bells! Remember global warming? Satellite records that haven’t been tampered with by NASA/NOAA or other AGW bureaucrats, show that there’s been no global warming in 18 years, 9 months! All that alarm bell ringing was a fraud to get MONEY, the root of all evil. Remember HIV causes AIDS? Well, after ruining any qualified scientist who resisted, they got what they wanted. Only one problem, HIV has never been isolated from a SINGLE AIDS patient! The French doctor who thought he discovered it now says HIV probably doesn’t exist! But, the HIV religion rolls on, too profitable to shut down without starving out thousands living off it. Why are humans so stupid? Massive doses of RF non-ionizing radiation is natural. The sun produces it! Ever get a sunburn? Duhhh…. Anthropogenic Radio Frequency Radiation dates back to about 1920. Why didn’t all the turtles die from it? I’ve stood at the base of 50KW AM radio stations for decades! Unlike the radar antennas pointing the RF, very efficiently by the way, up and away from the ground and those “turtle antennas” sticking out of the water, the big AM stations radiate right into the Earth, itself! Half the radiating antenna is an image as far down in the ground as the tower is above it. THE BIGGEST FISHING WORMS IN AMERICA ARE FROM RIGHT UNDER THESE TOWERS! Massive earthworms breed in the most intense RF fields you’re exposed to! They collect right around the big ground radial system out from the tower where the RF CURRENT IS THE BEST! Shouldn’t they have all been cooked by 50KW? Why not?? I’m 70, now. I’ve spent my life, since I was 10 and got my first ham radio license, around ham transmitters, some so powerful we bounced signals off the Moon! I’ve been around gigawatt military RADARs on ships, TACAN 20KW pulsed 1Ghz transmitters with ERPs in the megawatts, Megawatt (ERP) UHF (near microwave) television transmitters, broadcast transmitters, and lots of those DEADLY SELLPHONES! What happened to that “religion”? It pooped out! I guess I would believe your Bull$hit comment if I were actually a researcher trying to make money off research/grant money and not just an engineer trying to figure out why clusters of marine life are dying in unusual mortality events. I appreciate your comment though! I know, you don’t believe researchers. What about engineers? « It’s Going DOWN, I’m Yelling Timber!